Little remains of the original Glasgow University and its botanic garden, the main setting for Catherine Czerkawska’s The Physic Garden. Unlike the physic garden buried beneath Edinburgh’s Waverley Station, there’s not much to commemorate where the garden and grounds once stood behind Glasgow University’s Old College, nor the people who laboured there. Such gardens were, as Czerkawska shows, an integral part of University life, supplying samples for the practice of medicine and botany. However, Glasgow’s garden is part of an Enlightenment culture that has been progressively erased as the city expanded and its heart moved ever West. Today, Glasgow’s High Street, where the Old College once stood, hardly seems to merit the name. The Cathedral stills stand at one end, unaware of Glasgow’s spiritual shifts towards Empire and Industry and, later, Consumerism; the Tolbooth steeple at the other still keeps time for an earlier age; yet the stretch in between cycles between dilapidation and development. Old College Bar is under threat of demolition; College Street now points towards a branch of Aldi. The main gate of Glasgow University to which the latter once pointed — and through which Adam Smith, James Watt, and William Hunter once walked — has long since relocated to the University’s new home at Gilmorehill. The insight into this lost Glasgow is one of the main attractions of Czerkawska’s novel. Other locations such as Arran and Dumfries feature as a passing nod to eighteenth-century literary tours of Scotland, yet it is the skilful evocation of Glasgow at the turn of the nineteenth century that distinguishes Czerkawska’s work. Here, we find Glasgow in a period of transition as the old city increasingly yields ground to the modern mercantile and industrial metropolis. This transition is symbolised by the Physic Garden itself and the characters who work in and around it, particularly William Lang, the novel’s first-person narrator. Lang presents his story from the perspective of an old man remembering a past that is both marred by tragedy and marked by change. His story begins with him inheriting the position of University gardener from his father at a time when the garden is dying due to the foundation of a type factory on University grounds. This change from horticulture to publishing is mirrored in Lang’s own career: he recalls this early manhood as head gardener struggling with little success to halt the rot caused by pollution from the type factory, while also hinting towards his later life as a radical publisher in the period between the novel’s main action and its recollection. In this manner, the novel sets up a series of symbolic shifts, from traditional patterns of life towards modern forms of working, living, and knowing, and from an outlook harmonised with nature to one that asserts industrial mastery over the natural world, wreaking destruction upon the environment in the process. Yet, despite the strong contemporary resonance of such themes, Czerkawska does not lay it on heavy-handedly. Instead such themes emerge effortlessly from characters such as Jenny Caddas, the novel’s heroine, whose characterisation represents older ‘folk’ wisdom (even to the extent of evoking ballad tradition), and Thomas Brown, lecturer in botany and representative of new scientific ways of understanding nature. It emerges too from the books Lang reads at various points in the novel: John Reid’s The Scots Gard’ner (1683), a repository of traditional horticultural wisdom, and William Hunter’s pioneering The Anatomy of the Human Gravid Uterus (1774). At one point, a chance encounter with Hunter’s text shocks Lang as he realises that the celebrated illustrations by artist Jan van Rymsdyck represent actual mothers and their unborn children, exposing the unfortunate dead to an irreverent scientific lewdness even while they progress the cause of science. This key encounter also foreshadows later tragic events. This novel is not, however, a document of sweeping social and economic change. Nor is it simply a historical novel, despite the fact that the characters inhabit a very real Glasgow undergoing actual changes as witnessed by characters who were actual teaching staff at the Old College (most notably James Jeffray, Professor of Anatomy, and his assistant for lecturing in Botany, Thomas Brown, who are both central characters). The story itself renders a changing past on a far more intimate scale, basing its evocation of Old Glasgow around a central tale of lost friendship and bitter experience. The naïve William aims to marry the fair Jenny, yet the close personal friendship he develops with the charming Thomas Brown — his social superior in every way — blinds him to the illicit love developing between fiancée and friend, with tragic consequences. While I admit to being a little disappointed in the way the novel’s tragic conclusion plays out, other readers may appreciate the manner in which it moves into the familiar territory of Burke, Hare and Knox in its depiction of Professor Jeffray’s anatomy theatre. Plus the episode has a macabre logic given earlier references to the work of William Hunter. That aside, the novel’s central relationship allows an intriguingly up-close examination of class tensions during a time of unrest. William is servant to Thomas as much as friend, for example, while Jenny’s father is a radical weaver. The city streets William wanders at one point show the seeds of urban poverty and squalor that are later to characterise Glasgow. Here, social concerns are revealed through the opening up of characters, and the uncovering of historical detail through the personal is carried out with precision. The Physic Garden re-appropriates the wider — and too often middlebrow — literary motif of the garden and turns it into something refreshing, radical and relevant. 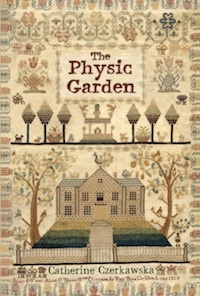 The Physic Garden by Catherine Czerkawska is published by Saraband, 2014. Ronnie Young is a Lecturer in Scottish Literature at the University of Glasgow, and co-editor of The Scottish Enlightenment and Literary Culture (Bucknell University Press, 2016).